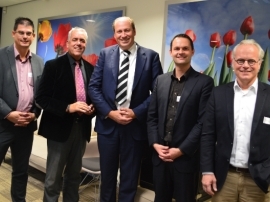 On 28 October SANEC and EVO-Fenedex organized the first "Exporteren naar Afrika" roundtable. The event gave insights into the do's & don'ts and tips & tricks when exporting to Eastern, Western and Southern Africa. Several experts representing various companies (Rhenus Logistics, DH industries) had the opportunity to share their experiences when going through their export journey. Several topics concercing doing business with the East African government were discussed by Ronald den Heijer, the owner of DH industries. He guided us through the procedure of obtaining tender documents, the preparation, and submission and opening. Oscar de Boot (Atradius) gave us an accurate description about the the export credit insurances for Dutch exporters to Africa. Furthermore, SANEC general manager in NL, Mark Agterdenbosch, continued with a presentation about finding the right and trustable partners when exporting to Southern Africa. The event ended with an exciting guided tour in the warehouse of Rhenus Logistics, followed by networking drinks. We would like to thank Rhenus Logistics Schiphol for hosting this informative event.